Ever knew your little effort of cooking this Keto Rasmalai (Keto Indian Dessert ) can be less than 1g net carb per serving unlike the traditional carb loaded ones ? Too good to be true, right ? And let me tell you, this is not even compromise in taste unlike some of the keto copycat recipes you find on internet. The recipe is very much straightforward and the video below makes the process very easy to understand. Though, refer the recipe notes below to after watching the video. What is Rasmalai ? How different is Keto Rasmalai ? And the good news is- Where one serving of traditional Rasmalai must be around 10-30g net, this is as low as 0.9g net 😛 Do the math. Well, I am planning to have 10 of these in one go after I break an extended fast ( I usually do 48 -72 hr long fasts once a month) and guess what – I won’t even regret a single moment of it. Haha ! 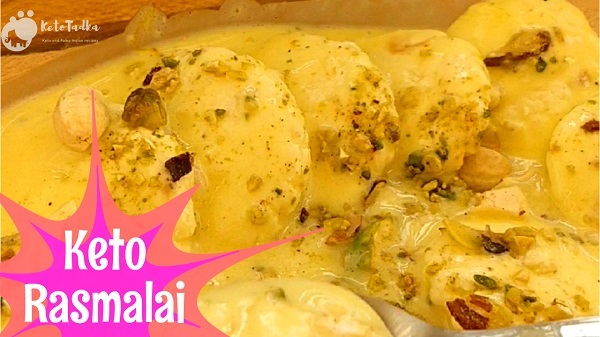 So is it worth the effort you will need to make the Keto Rasmalai ? Since you have asked this, I will be blunt. Every recipe on this blog is exclusively made for people wanting to revolutionize their way of eating. For the healthy options to replace the bad habits, for less insulin spikes, for less blood pressure, for low cholesterol , for those special occasions, for those pick-me-ups, for that keto party you have organized for the non-keto folks, for the love of food, and yes- for you. Why do you think big and respected Keto Bloggers like Martina of Ketodietapp.com , Carolyn of Fooddreamer, or Lisa of Lowcarbyum take so many pains to come up with new ideas and recipes ? It is not about money, trust me. The time one invests in blogging, especially food bloggers, fitness bloggers is not always about the money. Any good honest blogger will approve of this. For a blogger, even if one person could make his/her recipe and could manage his/her day without resorting to bad eating habits, is a win. You cannot imagine how it feels. So, since I started blogging and meeting more people, my message has been very straightforward. Take Some Time out To Cook !! cooking actually calms your mind. a brownie point to your self-love diary. ♥Your sweetener of choice- I prefer Xylitol over Erythritol and Stevia in this recipe. You have to knead the paneer exactly for 10 minutes. Nothing less or more than that. Do not miss this step or rush it. Boil 1 litre cow milk in a pan. Add the lemon juice after the milk comes to a boil. The milk curdles and whey starts to separate. Let the whey separate completely. Switch off the flame. Drain it in a cheesecloth lined sieve placed on an empty vessel. Wash the retained milk solids with some water and tie the cloth tightly and let the whey drip for 30 minutes. Take the paneer in a deep dish and knead it until it forms a soft dough . It takes 10 whole minutes to knead the dough, do not rush this step or the paneer discs may break while cooking. Take 1 litre of water in a wide pan and let it come to a boil. Gently place the discs in the water and cover with a lid. Cook for 18-20 minutes. The discs swell and double in size. Add almond milk, keto condensed milk , cardamom and saffron. Bring it to a boil for 10 minutes. Switch off the flame. Let it cool completely. Remove the rabdi in a bowl and refrigerate for 1 hour. Soak the discs with the rabdi for 20 minutes and garnish with some almonds or pistachios. Serve it cold and enjoy !! I died and went to Keto heaven! Thanks for awesome Keto based recipes! You rock! !